Carvey Sando, 17, traded in childhood memories of obesity and scrutiny for a nutritious, healthy lifestyle thanks to supportive parents and a dedicated trainer. For the first 11 years of my life, I've always been the "fat" kid among all my friends. I used to get teased all the time due to my weight and it wasn't easy for me to make friends. I wasn't only socially awkward, but physically I was always tired and wasn't really skilled at any sports. Because of that I started exercising more and eating less, but it wasn't until I was 17 that I discovered the world of fitness. From the very first moment I stepped foot in the gym I was hooked. I was always looking forward to going to the gym after school and working out, and I became more aware of nutrition. Many of my friends kept teasing me and said that I was only wasting my time in the gym and that sooner or later I would give up. However, the teasing only fueled my intentions even more to get more fit and better than all my friends so that one day I could prove to them that you can achieve anything if you really give it your all. I was lucky to have such supportive parents regarding my activities in the gym. 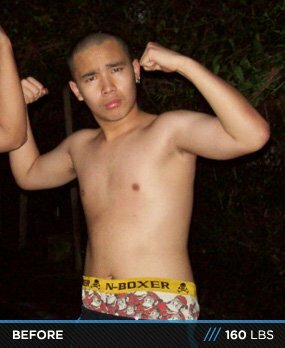 I didn't have much money yet in high school to be buying a whole lot of supplements, but my parents offered to pay for whatever supplies I needed in order to create the physique I desired. I hired a personal trainer who was a bodybuilder and he taught me a lot of the things I know now. He was always pushing me to the limit and beyond. I wouldn't be aware of what I am truly capable of if it wasn't for him. However, it wasn't only the training that I learned from him. One of the most important lessons that he thought me was the nutritional aspect of bodybuilding and how important it was in order to truly achieve the best results out of the hard and long hours of work I put in the gym. I also had a lifting partner who happened to be a buddy of mine from school and we kept each other motivated as we progressed together through lifting. Don't underestimate the importance of nutrition. If anything, it should come first before your training if you truly want to achieve results. Don't over-train, know your limits. Don't be afraid to ask those with a better physique than you, we all start from somewhere. I'm sure they'll be more than willing to help. COMMIT to your routine! Don't make excuses! There are 24 hours in a day, I don't believe that people can't find the time to spend at least an hour in the gym. Just remember, it'll all be worthwhile in the end if you truly give it your all, this might sound cheesy and cliché but you'll be surprised how many people would come up to me asking for advices only to discover that they don't have what it takes to commit. NEVER take your body for granted! No matter how much you've progressed, always have the mindset that there'll always be room for improvements and that if you want to keep your physique, you will have to work for it. Don't think of it as a commitment, think of it as a lifestyle.